Hey guys! I realize I’ve been a little M.I.A. lately. When I got back, I was so ready to dive into so many recipe and share them with all of you, but my life has been a little tragic this last week. There has been a lot of adversity going on in my hubbies family, which I don’t feel comfortable sharing, but then just recently I found out my father had 3 mini stokes in less then 24 hours. If you are wondering how a mini stoke differs from a full on stoke, it’s that smaller blood vessels get clogged cutting off blood flow to smaller areas of the brain. Less damage, but still they were able to tell that areas in the frontal lobe of his brain had died from the lack of oxygen. It’s ironic how in my life, whenever it rains, it pours. I never have just one thing to deal with. It’s always a smorgasbord of life shoved at me all at once. It’s funny how secure you get with things when nothing big like this has happened to you in a while, and then you find how much you’ve taken things for granted. This whole experience has been kind of hard on my family, but I’m confident that my dad’s doctors will be able to stop any further damage from occurring and resolve most of the problems that have caused the incident. See Also: Best Chocolate Chip Cookies Ever!! Enough with depressing stuff though!! I wanted to post to get my mind off of everything going on. So, here is one of my own recipes. I saw some Reeses Rice Krispie Treats on Pinterest, and when I went to go read the ingredients to make them, I realized that they had no marshmallows included in the recipe… HOW CAN YOU HAVE A RICE KRISPIE TREAT RECIPE AND NO INCLUDE MARSHMALLOWS!? I’m sorry. I realize I take my food a little too personally, but really. If it doesn’t have any marshmallows, in my humble opinion, it’s not a real rice krispie treat. So, for a get together with my hubbies work friends, I decided to make my own concoction that included marshmallows. You should know though before you begin, I like my rice krispie treats overly gooey. If I can’t see a string of marshmallow when you pull apart a rice krispie treat, then there isn’t enough marshmallow. And that’s how I created this recipe to be, an ooey-gooey mess of chocolate, peanut butter, and marshmallow (with a little crunch from the cereal :). So, if you plan on serving these warm, be prepare to lick your fingers when your done. Enjoy!! P.S. Here’s about how big you want your peanut butter cups diced into. Not too small. It’s better to have them be a little bigger then on the smaller size, cause they’re gonna fall apart a little bit when you stir them into the marshmallow. I cut mine, 2 times horizontally. Then 2 times vertically to get 9 cubs out of 1 peanut butter cup. In a large bowl, combine cereal and diced Reeses. Set aside. Spray a 9 x 13 in. pan with cooking spray and set aside. In a large pot melt butter over low heat. Add karo syrup and marshmallows and stir continuously until mixture is smooth. Remove from heat and add cereal mixture into the pot and fold together just until cereal is evenly coated. 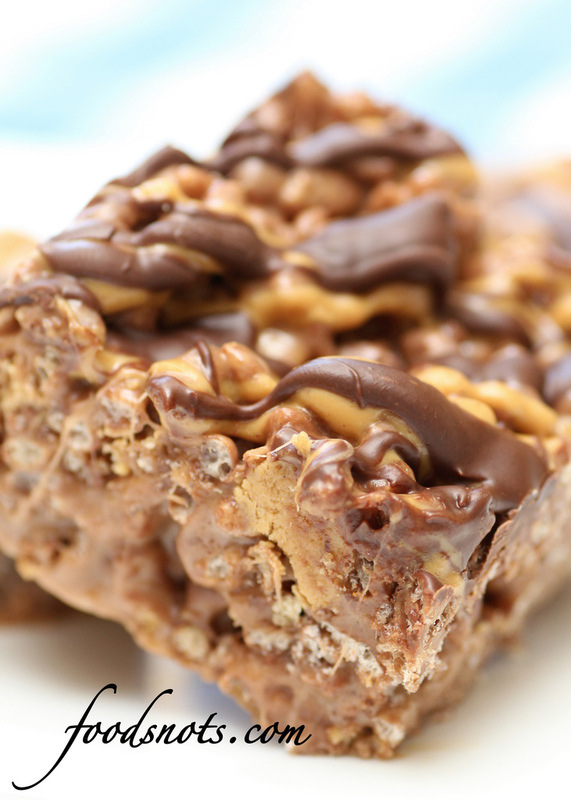 (Peanut butter cup pieces will fall apart as you fold together your ingredients, so don’t over mix this.) Press mixture into the sprayed 9 x 13 in. pan. Set aside. In a small microwave safe bowl, add peanut butter. Microwave for 30 second to a minute to melt. Set aside to let cool slightly. In a separate small microwave safe bowl, melt chocolate at 30 second intervals, stir between intervals, until smooth. Set aside to let cool slightly. When peanut butter is cool enough to handle, transfer into a small zip lock bag. Clip a small piece out of the corner and pipe onto rice krispie treats, zig-zagging back and forth. Repeat steps with chocolate, placing in a small zip lock bag, and piping over the peanut butter. Either let treats sit at room temperature to allow chocolate to set up, or you can pop the pan into the fridge for about 5 minutes to speed up the process. Cut and serve. Makes a 9 x 13 in. sheet of treats.